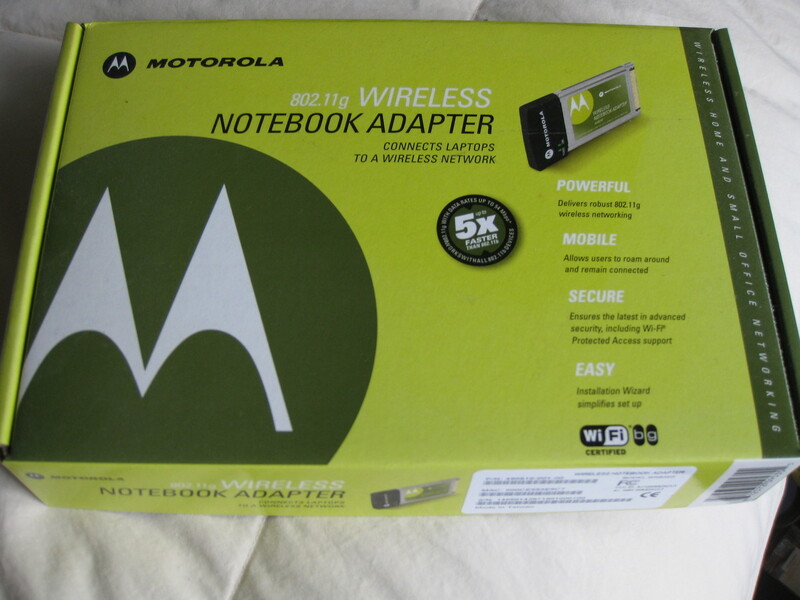 Motorola 802.11g WIRELESS Notebook Adapter Description: Previously used item, in great working condition with all parts and accessories in original box. Model # WN825G box contains Motorola Wireless Adapter PC, Cd-Rom and instruction sheet Gently Used , Great working Condition includes all original material/items/box ALL BUYERS - HOW TO PAY: PayPal Preferred SHIPPING: Please note, the price for shipping also includes consideration for handling (packing materials, And paypal fees). And, in most cases, the price I charge for shipping does not cover all handling expenses noted above. If you don't agree with the shipping price, please do not bid. U.S. shipping Only may include Insurance and/or Delivery Confirmation INTERNATIONAL SHIPPING as Calculated by USPS Buyer to pay international shipping based upon applicable USPS international priority service charges. Please contact me for applicable shipping fee. All SHIPMENTS TO CONFIRMED ADDRESSES ONLY I Do Not SHIP TO: ITALY, GERMANY, MEXICO, TURKEY OR SOUTH AMERICA. ALL SALES ARE FINAL: no refunds or returns ... but please email me if there is any problem with your purchase. Items come from a clean, smoke-free, pet-free home. I am Paypal Verified. Thanks for Looking! Please Check out my other items! International Buyer to pay international shipping based upon applicable USPS international priority service charges. Please contact me for applicable shipping fee.